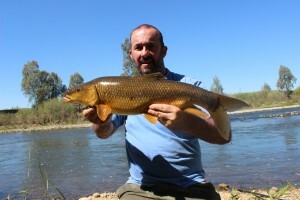 THE FANTASTIC BARBEL FISHING OF SPAIN!! Well what a fantastic week was had in Spain, the fishing was tremendous and the company even better. 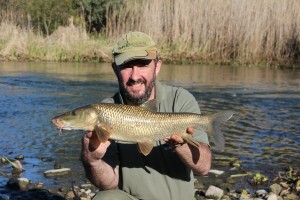 I had thought that last year would take some beating with me getting amongst the Comizo and Smallheaded barbel of the Guadiana river system, making my grand total of barbel species landed almost equal to the numbers of rivers I have landed them from, this year however I went a little better and added at least one and possibly two more species. 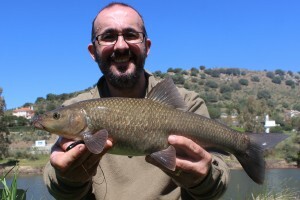 Not all of these species are fish that I am likely to come across whilst fishing the Guadiana catchment but some are, up to now I have definitely landed the mighty Comizo and the equally if not harder fighting Smallhead ( L.microcephalus) it now seems that according to the locals we may have landed examples of Luciobarbus sclateri or the the Andalusian or “Gypsy Barbel” commonly referred to as “Gitano” by the local anglers, these are a very pretty fish that are bi-coloured horizontally along the lateral line, the problem is trying to work out if the catchment actually holds them, up to now my research seems to indicate that the Guadiana does indeed have access to stocks of l.sclateri via some of its lower tributaries . The gypsy barbel (Barbus sclateri) is an endemic species of Spain with a southern distribution covering the Guadalquivir river basin. This includes the rivers Guadiaro, Guadalete, Guadalhorce and Segura, tributaries of the lower reaches of the Guadiana and other small basins of southern Spain and Portugal. 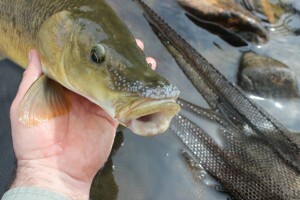 Another problem is that the barbel species seem to hybridise quite freely and this seems to have been made worse by our building of dams and altering waterways which pushes together the spawning populations and increases the potential to interbreed and therefore show characteristics from both species. The one above I believe is a L.sclateri, I could be wrong, it may just be a bi-coloured Comizo and not a “Gypsie” but my gut says it has a bit of “pikey” in it, if it isn’t full pikey all along! The next one is a classic Comizo, look at the length of the snout, it is huge, it is almost a pike like beak…pike like…Ahhh!!! 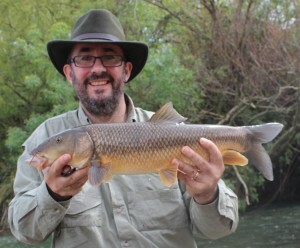 The comizo have a huge head to body ratio and they use this head to turn over boulders on the river bed with far more ease than our own barbel species. 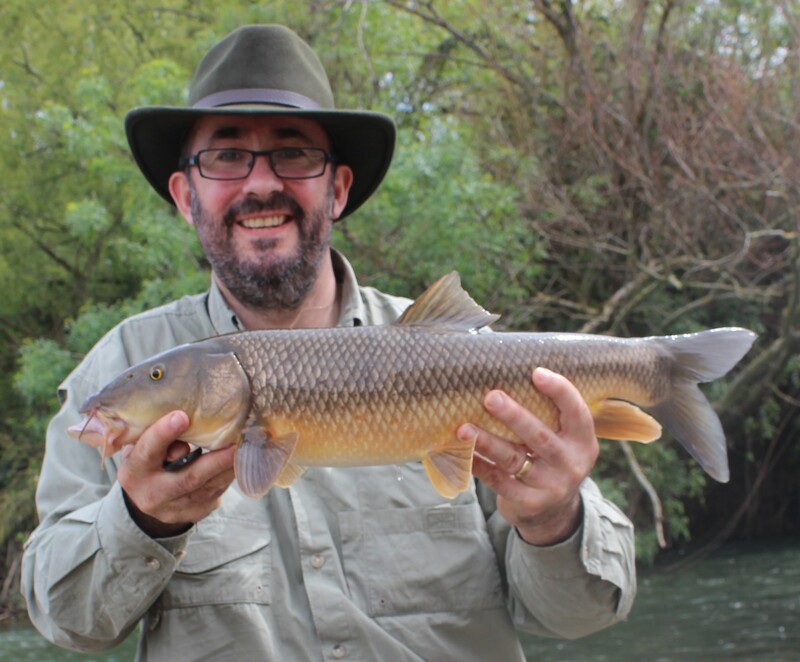 On the first day of the holiday this year I watched a school of barbel completely plough a stretch of the river in search of food, I could actually hear them clattering the river bed. They really are an impressive fish and one that may be in need of a little help as its distribution is rather restricted and as such its numbers have been impacted by pollution and agricultural practices. It is thought they may have lost 30% of thier numbers over the last century. In Spain it can only be found in the basins of the Tagus and Guadiana rivers. 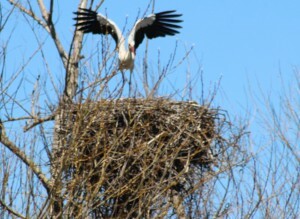 There have been reports in the past to be found ¡n the lower Guadalquivir and Ebro rivers, but seems to be extinct now. The pretty cousin of the Comizo is an equally endangered species known as the Smallhead, Luciobarbus microcephalus ( Micro as in “small” and cephalus as in “head”), once again these are only endangered because they have a very restricted catchment and as such are more at threat from pollution incidents or the introduction of alien species or the threat of interbreeding with other related species. Pound for pound I would have to say that Smallheads go a bit better than the Comizo barbel, my mate Ian “hobby” Hobkirk has had a 12lb Smallhead and he says the fight was epic, my biggest would be a bit more than half that size and I can vouch for the truth of his point, they are real warriors! They may be the pretty cousin but they can really set off on a blistering first run! 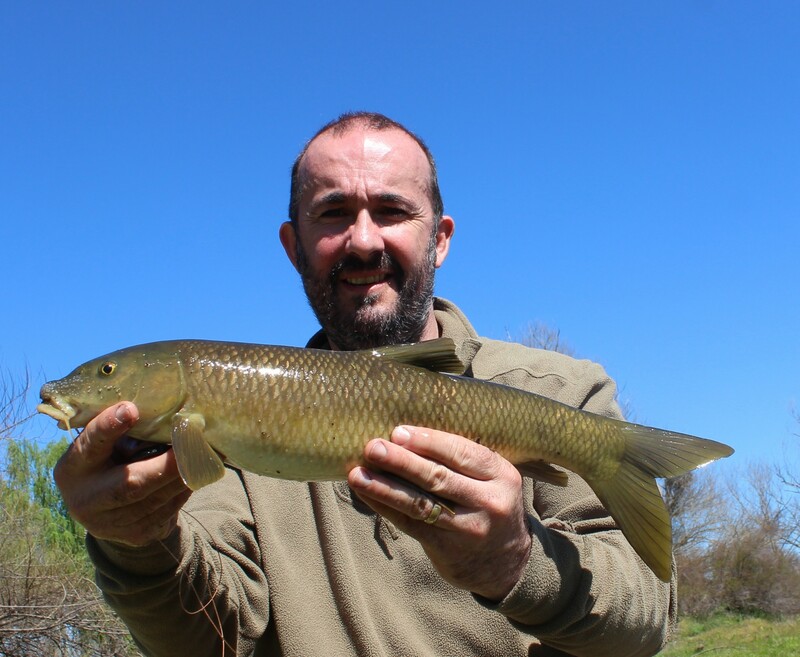 But when it comes to first runs, there is NOTHING to touch the “Bocagei”, nothing in barbel fishing had prepared me for this first run…Wow! Tony thought it a good idea to travel onto a different catchment to fish a different river system, we fished a river in the town of Coria, in the town the river is as many rivers are, impressive but “controlled” and “engineered”, with walls and bridges and all manner of human things on or around the waters edge, fish could be seen in the margins , big fish as well. I was tempted to ask to stay here, I would love to catch a big Spanish carp and what was tearing up the silty edge looked to me to be bloody great huge Spanish carp…but is a holiday and everything should remain social when on holiday, so me playing Billy No-mates would be a waste of a day in my opinion. And so we drove, not for very long, Coria isn’t that big and once we were out of the city the countryside opened up…Oh…Wow! This is some seriously good bird watching country, vultures and eagles soar overhead almost continually. I chose to fish below a little set of rapids and was informed that I was only the second Englishman to ever fish that swim.Tony being the first. I was happy with that! At least nobody would be lining up behind me to fish once I had gone! The only thing behind me was a Pterodactyl sized Stork sitting on eggs! Storks are a huge bird and not at all aggressive considering thier size, a Mistle Thrush would have been more of a problem to fish near and even a Wren would have given me a bollocking far more severe than the little bit of beak clicking I got from them. I did a little bit of leading about and found a depth of six to eight feet shallowing up to a couple of feet as it moved out into the main pool, it looked awesome! Outr came the PVA and I made some big sticks to attach to the line just above the feeder as a booster, I made 4 up containing about a pint or so of maggot between them, the PVa also had a few dry pebbles mixed in with the maggots to help keep it in place as it melted…I have no love of PVA…In fact I hate the stuff. That aside I was fishing on two rods within a few minutes, one out onto crease at the edge of a dead spot towards the middle of the pool and one into the side pool, the chair was made comfortable and I sat back….This lasted five minutes. I cannot sit with all this stuff going on around me, I like to mooch around my peg…First off I see a jaw bone in the margins, its a bit of an old boar that has died somewhere upriver….I will have that! Then I see the otter poo. A lot of otter poo. A healthy river can support a lot of otters, otters will not impact to badly on a healthy river because there is a lot of food for it to go at, they will feed on the crayfish as is proven by the poo being full of crayfish long before they start eating barbel…but I won’t go into that too much as the rod in the side pool has just gone off! I lift into a solid lump of fury. This is dead weight, it’s just hanging…hanging…hanging..And then its off…..Oh my! It’s not happy, it’s half way across the main pool in about five seconds and there is not a lot I can do about it, all I can do is keep calm. I have done this before a million times, ok, not quite like this….This is mental. 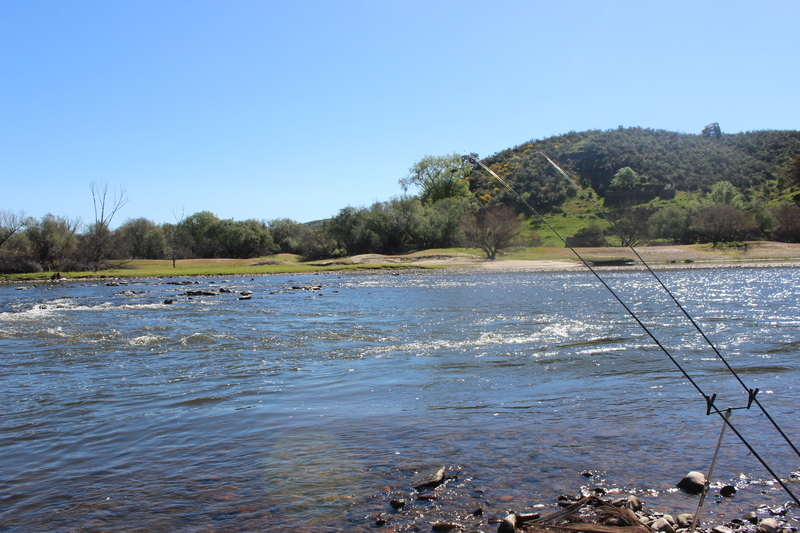 Slowly I get some line back, the thing is content to drift my way and then it went off…Oh lord it went off, out intoto the main stretch of the river and down towards Tony the fight was like nothing I had ever experienced…Insanity…no control whatsoever….and then the hook pulled! the rod pinged back from its fighting curve and the world dropped out of my arse…what had it been?